If you were ever wondering if politics is a 'social determinant of health', well, just take a hard look at Zimbabwe. A few decades ago, the country was the breadbasket of the sub-Saharan region, and it is now heavily dependent on food aid and imports, with an economy crippled by massive debt and astronomical levels of inflation. In fact, its chief export in the coming months, besides Zimbabweans, could be infectious disease. This week, the Zimbabwean health minister, David Parirenyatwa, has declared the nation’s recent cholera outbreak a national emergency, and has asked for outside help in bringing the epidemic under control. But to bring the epidemic under control, you would need more than just oral rehydration therapy and truckloads of antibiotics. You would need a functional health care system. But that would require a government actually devoted to the welfare of its own people, rather than lining the pockets of some of its own people, and blaming foreign powers (while also asking them for stuff) whenever things go wrong. So what to do? The Kenyan Prime Minister Raila Odinga -- in a rare display of backbone by an African leader -- has called for the isolation and ousting of Zimbabwean president Robert Mugabe. In the grander scheme of things, this could be as effective a public health intervention as any. Epidemiologist John Snow is said to have removed the handle on the water pump on Broad Street in London in 1854, once he discovered that contaminated water from the pump was responsible for the city's deadly cholera epidemic. The outbreak dissipated soon afterward. 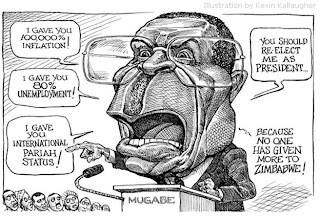 In Zimbabwe, Mugabe is the pump handle. UPDATE: I was premature in calling President Mugabe the 'pump handle.' Today in a news conference he declared that there is no cholera epidemic in Zimbabwe. So it would be better to characterize him as a public health version of Jesus Christ the Savior, healing sick populations with his miraculous powers.